It’s Time to Start Using a Clothesline. Seriously. Now! Shady backyard? You can still use a clothesline. Just make sure to get your laundry out early in the day. I know many Americans are banned from stringing up a backyard clothesline, but for the rest of us, air drying your laundry is about the smartest thing you can do. It’s frugal, it’s eco-friendly and it makes your clothes last longer. I live in depressingly soggy Portland, Oregon, yet I’m still able to use an outdoor clothesline April – October, (although it’s sporadic in early spring.) I use indoor racks for laundry the rest of the year. I screwed this eye bolt into one end of my back porch and tied the clothesline onto it. 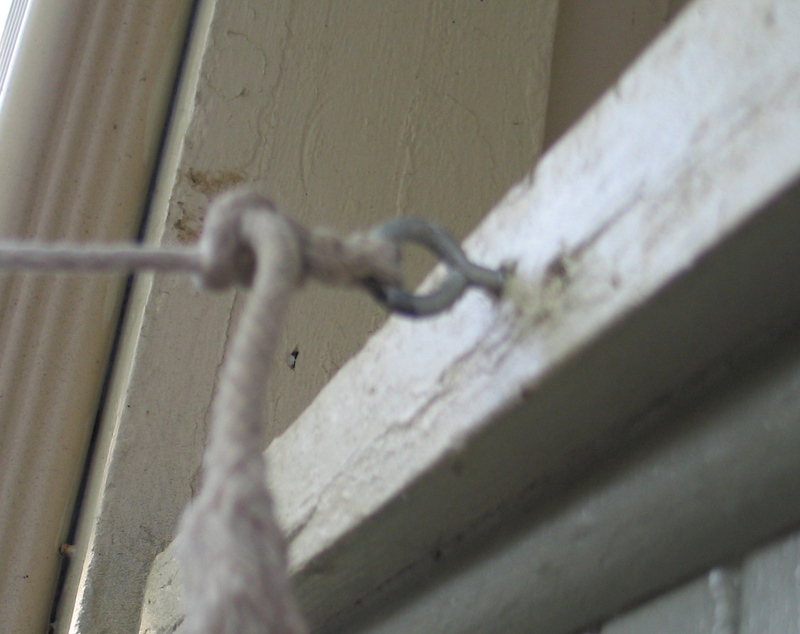 I tied the other end of the clothesline onto a clip, which I then attached to another eye-bolt. (This is our play structure.) 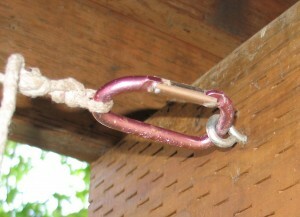 I can then unhook the clip and attach it onto the porch end when I care about how my backyard looks. Which is about twice a year. I also use a couple of different indoor/outdoor clothes racks. This one I bought at Ikea and have been happy with. It fits a surprising amount of laundry, and I’ll often use it to dry our cloth napkins on the front porch, which gets strong afternoon sun. No neighbors have ever complained. I make sure to wash our cloth napkins separately from our clothing, as they can be greasy and have been known to put oily stains onto our clothes. This is not a big deal, as I now have a specific basket in our kitchen for soiled dish towels and napkins. I usually wait to launder them until I'm washing our bath towels. You may surprise yourself and find that air drying your laundry is actually an enjoyable task. There’s no way to hurry the process, so it ends up being a bit relaxing and meditative. Your clothes will smell fantastic, and your sheets will be downright luxurious. I get embarrassingly excited when sunny days return to Oregon, not because I can start hiking, biking and playing in my ironic hopscotch league. No, because I can finally start air drying all my laundry again. Need additional information about air drying your laundry, (although seriously, you might be over-thinking it) you can always click over to Project Laundry List. I love the idea of line-drying, but I have a problem. When we lived in Oklahoma (you know, where the wind comes sweeping down the plains), everything ended up with a layer of red dirt. Now that we’re stationed in Georgia where it’s nice and hot, everything has a layer of yellow pollen. I can’t justify hanging our clothes outside if they will just need to be re-washed. Do you have any suggestions, other than stringing clothes around the inside of the house? I’d just hold off on the line-drying until the pollen subsides. It shouldn’t last all summer, right? Here we mostly have awful yellow pollen problems for a few weeks and then it calms down. Hmm . . . this is out of my area of expertise. Anyone have any helpful suggestions for Stephanie? I LOVE to hang my laundry outside but in Ohio in the winter it is no really possible (though I have seen the Amish do it!) and in the early Spring my allergies are so bad that I dare not put my clothes outside to dry. Wearing around pollen all day is bad for my breathing and I like to breathe! Once tree pollen time is done I can hang things out without a problem. Wow, thanks guys! This is our first summer in Georgia, so we’ll have to see if the pollen dies down. My car has been light yellow since February – hopefully it quits soon. I guess for the time being I’ll look for an indoor clothesline I can put in the spare bedroom with the fan on. I am in Georgia, too. In my part of the state (Savannah) it is pretty much gone. You shouldn’t have to deal with it much longer. I grew up in New England. I learned to be cautious about hanging laundry outside in the winter. I was asked to bring the sheets in that were frozen. I folded them outside and placed them in the laundry basket. as they thawed we no longer had sheets but large hankies. The sheets broke apart along the fold lines! Shake the sheets a few times before you fold them, that knocks the ice off. I don’t know if this will work for her but I hang all my newly washed clothes in the garage. First onto hangers and then onto bars. No pollen there. Oh, how I remember the pollen. I lived in Atlanta in a condo with no balcony for years. I used a folding laundry rack and, in the tiny laundry room itself, I hung a shower curtain rod. Anything that would end up on a hanger in a closet was hung wet and hung on the rod. My jeans would even dry overnight. If you have a garage you can can have a single line, removable or not, inside. I do that now. Works very well. There is no way I could ever hang laundry because of allergies. Right now, the yellow pollen is tree pollen. Then comes grass pollen which lasts usually until July. Stephanie – hi, I’m in southern Manitoba (the northern plains.) Well, we do sometimes get dust on our outdoor clothes-lined clothes, but to avoid this I don’t put laundry out on really windy days, and because what dust there is is dry, a quick shake gets rid of what little does land on the laundry when it’s ready to come inside. I don’t really have any advice about pollen, never noticed a problem with it. I love putting laundry out outside! For awhile we didn’t have a clothesline, so I would drap jeans and big blankets and so on over the porch rails, over the playhouse, my neighbour sometimes used the fence…I’m told that you can use bushes, too! Americans are banned from putting up a clothesline?! You learn something new everyday. The hills hoist is an icon of Aussie backyards. It’s very rare to find an Australian backyard without a clothesline. Same as it’s very rare to find a dryer in Australia. It’s just not the done thing. I have always hung my clothes outside from April to November, then down in the basement the rest of the year. For the first twelve years of my married life, I didn’t even own a dryer. Now I’m spoiled and in the winter toss the towels, underwear, and socks into the dryer and only hang the actual clothes. But now that spring’s here, everything gets hung up outside, barring rain, of course. Unlike most people, I like the looks of a line full of laundry. It’s downright homey. Air-drying my clothes is what made me LOVE Laundry Day! Seriously. I’ve never put my clothes outside, as we have lots of trees, pollen, and allergies. I just use my drying racks indoors. (I have that same IKEA rack, plus another rack I bought at Target years ago.) Hanging laundry is very peaceful, and it honestly makes Laundry Day enjoyable. I’m not really sure why, but it truly transformed my feelings about doing laundry. You know how rainy England is, right?? I have never owned a dryer in the 25 years (nearly) that I’ve been married. Outside drying when possible, inside on airers when it’s wet. And yes, I do have children (and they’re messy boys!!). I have a couple concerns that I’m hoping you can alleviate. The first is pollen (I have terrible allergies and my allergy “season” is April-October!) but I think in just going to have to experiment with that. The other issue though is that when I’ve airdried towels in the past they become very stiff. Does the sun help, or do you have to buy fabric softener? I currently use vinegar in my wash but haven’t airdried since starting that. We just deal with slightly stiff towels, but you can put the dry towels in the dryer with a few clean tennis balls for 5 min on NO heat to soften them up. As for allergies, my husb has to take allergy meds regardless of wether I dry clothes out or in no matter the season. Wearing clothes dried outside does not make his allergies any worse. I take allergy medicine too, but if I’m outside even with the medicine they’re still bad. I mean, they’re fine with medicine, but any time spent outside sets me back several days in dealing with them. But I’m willing to give it a try! I have those blue dryer balls, so I think I will try doing that to my towels! Great idea! You just need to adjust your mindset here. Think of your towel as a “spa-style loofah sheet.” Ahh . . . exfoliating! P.S. I actually prefer the feeling of air dried towels, they seem more absorbent. Fabric softener will make the towels LESS absorbent. To see how it coats the fabric, take the lint screen out, clean off the lint then pour water in it. If you add fabric softener to every load, the water will not drain easily. Just think of what it’s doing to your laundry. Vinegar works well as does vigorously shaking or snapping the laundry before hanging – gets out the wrinkles too. I love the feeling of air-dried towels! Overly soft ones don’t seem to dry me off as well. Another bonus of drying outside, our shirts have less wrinkles! I’ve convinced my husband to think of them as partially ironed/starched rather than stiff from line drying. If we want a little softness or our allergies are acting up, then we throw the load in the dryer for a few minutes after they are almost completely dry from the line. No dryer balls or tennis balls necessary! They get soft on their own. I air dry as much as I can inside the house. I just put the clothes on hangers and hang them in doorways. Yes, they sometimes get in the way, but it works. I really only use the dryer for towels, sheets and pants. I could probably do better but I’m already cutting our dryer use down by about 3/4. We need to get a clothes line for outside but my fiance is dead set on getting one that re-tracks (just like he’s dead set on owning every single power tool known to man kind). I think if I actually had a clothes line in our basement none of this would be a problem, so that may go down on his “honey-do” list! I love, love, love hanging out my clothes on the line – my favorite things to hang out are my sheets – there is nothing in the world like sleeping on a good set of sheets that has been line dried! I also do all my bedding & everything else I can – I do draw the line at undies & socks but may try using my drying rack outside for socks. You and I are on the same page. I love drying my sheets and bedding outside but usually save all the socks and underwear for the dryer. i just dragged my clothes horse out from the laundry room this weekend. and it’s also on my “to blog about” list for this month. we don’t have a place for a line, and i had plans to build posts. but then, i bought a clothes horse spontaneously at the clinton/division street fair last year. during these month i line dry everything except things that i want a shrink effect on (some of my shirts). It seems crazy to me as an Australian that clotheslines are not permitted everywhere in the States – hills hoists are as ubiquitous as backyards here. I get my washing dry both summer and winter outside – admittedly no snow, but during winter I get the washing out early and it always dries. In summer and autumn I just have to fight the ‘monsoonal’ late afternoon rain. I keep thinking that every time I throw another load into the dryer. I swear I will start once this darned kitchen painting is done!! I love line drying!!! I don’t have an actual clothes line, but I do have two large wooden racks that i use. Work clothes just get put right onto plastic hangers and Hung in the doorways. When the weather is move, the drying racks stay on the deck. To fight the pollen/spider issue, I just toss all loads in the dryer on high heat for 3-5 minutes when bringing them inside. DH has a very professional job, so I toss his shirts into the dryer for 10 minutes to avoid wrinkles. Six shirts will be done in that time, and can be Hung up. No need to iron!! Like the Aussies I’m astounded that there are places in the USA where you can’t line dry. Here in the UK everyone does it. I have never owned a dryer and never wanted one. In bad weather I have some fixed poles at one end of my kitchen for drying ( the clothes do not smell of cooking). It has never occurred to me that hay fever sufferers should avoid line drying. I and most of my family suffer in varying degrees. It certainly won’t stop me line drying though. I love stiff towels by the way -free exfoliation! They are very invigorating in the morning! Okay, I bite. I will give this a shot. We are renting a townhouse, but have an enclosed patio area. Thank you for posting your drying rack pictures. The rack from Ikea seems to be exactly what I have been looking for. I love the smell of clothes-line clothes. They smell like ‘outside’. The wrinkles and crusties bother me somewhat (even with vinegar or what have you as a softener – maybe I just don’t shake them out enough). Well maybe not me so much as other people since I don’t bother ironing after but wear them anyways. The biggest problem I find with hang drying is actually my neighbours, who burn sh-t all the time (by sh-t I mean non-wood things, not actual cow-pies) and it stinks and gets in my clothes sometimes. I am not too keen on indoor hang-drying though due to the smells I seem to accumulate: supper smells, musty too wet for too long smells, etc. But man I love that smell of ‘outside’ that even people get when its windy and chill. If the Northeast would ever warm up, I’d move my clothes to drying on the line outside. But right now it’s 45 and rainy, so the clothes are hanging in the bathroom. They should be dried by tomorrow because the woodstove is going and it gets very dry in here when it’s cranking. And yes, that’s how cold it is in the NE today. I have a lovely LOVE relationship with my clothes line. It’s a little embarassing to think about how much happiness I get hanging clothes out there. On good days, I’ll do 3 loads! And yes, I even hang the undies out. I try to keep those on the side farthest away from the neighbors sight though. My parents had seven children, so every week there was a lot of laundry (for those days). Mother would have clotheslines all across the backyard. On the outer lines, she would hang bed sheets and towels. Then shirts, blouses, skirts, trousers, and dresses. On the inner most lines she would hang the undies. When the weather was warm & windy, she would wash blankets. Mmmmm. Also, I remember that my husband saw a similar rack at Costco last year that he said looked sturdier. I’ve not any problems with my rack being not sturdy enough though. I’ve got the one from Costco. It is pretty sturdy but I bet it doesn’t fold up quite as slim as yours Katy. Does everyone wash their dinner napkins and tee towels with their washclothes and bath towels? Am I a freak to think that is unsanitary? I am sooooo not a germ-o-phobe, so this does not even occur to me. I wash all towels on hot for sanitizing purposes, so I wash them all together (unless something is just TOO greasy!). If someone’s floors are “clean enough to eat off of,” I am SCARED of that person!!!! Jessie, that’s my sentiment too 🙂 I just do dish-related and food-related items separately in a small load. I have a backyard for the first time ever & plan on putting up a clothes line. I may start with the Ikea rack. I’m not sure I have a place to hang a line. Looking forward to sleeping on line dried sheets since everyone seems to think they’re great. I really don’t like the feeling of air dried stuff, even shirts, pants, undies etc. It also seems like clothes need to go int the dryer for 10 minutes or so just to get the wrinkles out and some softness in (with a dryer sheet). I don’t actually enjoy hanging laundry but in the interest of my clothes lasting longer, we do hang most of our nicer clothes to dry. I just use one of those tension rods in the hallway and hang things on hangers from the rod. This way when they’re dry they just get hung right in the closet on the same hangers (except that stuff that gets folded). I’ve never had my sheets feel stiff before but the towels are a little stiff sometimes. I usually put them in the dryer for a couple of minutes before hanging and that seems to help some. It also helps get rid of wrinkles for our other clothes. I’ve found that the stiff feeling is at its worst right as your pulling it off the line, at the worst, by the time you’ve put the clothes on an stepped out of your room they’ve relaxed. It’s just something you get used to, people used to starch their clothes you know. Also I didn’t use to but now I way prefer the feeling of stiff towels. I feel like its the last step in the shower when I do the towel back scratch. Feels so good! As a kid my mom liked to send me out to hang the laundry & bring it in (heaven forbid I forgot and it rained LOL) but the bees loved to help in the whole process & it drove me nutty. Needless to say once I became a housewife I haven’t tried it again. How do you cope with the bees? I love everything about line drying, both outside and on racks inside. I love the stiff, crisp feel of the the clothes, the smell of them especially after drying outside, the actual process of hanging them, etc. The stiff fabric softens up after a few minutes of wearing something anyway. Like you, Katy, I’m not a germophobe at all, so I wash cloth napkins, dish towels, bath towels, washcloths, and white socks and underwear all in the same load. I might use a little bleach, but I don’t use hot water. We don’t even have the hot water hooked up to our washing machine. I hang all of it, including the underwear. Everyone wears underwear (or they should…LOL), so what’s the big deal? Also, while we were looking for homes to buy, one of the biggies on the list was that it be in a neighborhood that allows clotheslines. My husband had really bad allergies, but we line dry all the same. He works outside and when he gets home he loves to be outside gardening, so a little pollen on the clothing doesn’t make it any worse for him. I live in Phoenix, AZ and like the Aussies, I’m able to hang my clothes on the line outside all year long. I love it. In the summer, it’s so freakishly hot here that a whole load of laundry will dry in less than 15 minutes. I’ve lived in AZ for about 26 years and have never owned a dryer. Also, this may sound strange, but my laundry “room” is outside! Our washing machine hook up is on the exterior of the house, under a covered patio. I’ve hung up shelves to store laundry detergent & supplies out there, put down a little throw rug in front of the washer and it’s as nice & efficient as a “real” laundry room. An outside laundry room sounds really neat! I have never thought of that but it makes sense where you live. Couldn’t do that in OH though. As far as stiff towels, I read somewhere that it’s usually because of too much soap/detergent residue. I use a washer ball and very little soap, and since I have skin allergies, I always rinse and rinse and rinse, and I’ve never had problems with stiff towels. I’m not sure if it’s lack of residue or vigorous shaking when they’re hung, really. My napkins and tea towels go in with regular clothes, too, and usually hang on the backs of my kitchen chairs to dry. I started line drying last year because of you, Katy, and I can’t believe how much I enjoy it. I find it so relaxing to be outside hanging laundry on a warm morning. Makes me feel so retro and housewifey LOL! I don’t think I’d ever consider living in a neighborhood that banned clotheslines (cause they’d probably ban me from keeping my small flock of chickens, too.) It is kind of silly to me to think laundry hanging on a line would be offensive to someone, but I guess it is. Living in a community with HOA rules limits us to hanging laundry on drying racks on the lanai, and on hangers by the side garage door on a rod. During bad weather the drying racks go in the guest room and laundry dries in 24 hours. Not typical, but yesterday I had to dry the sheets inside because of smoke from wildfires. Used the ceiling fan for about an hour to give them a head start and the sheets were dry in about 6 hours. Not bad for a set of king sheets – would have taken 4 hours outside. On our way to the library last week we noticed a lot of new clothes lines in a neighborhood of low-income/retired folks. Glad to see it. I live in Virginia and hang my clothes out year-round. In the winter, I joke that they are “freeze-drying”. I have a pretty shady backyard so my only problem is in the spring when a lot of the birds are returning, but the leaves on the trees aren’t thick yet and I may have a bird poop “problem”, but nothing that will stop me from hanging my clothes. My lines are hooked to my trees and I guess I just don’t notice them anymore. I love my fresh-smelling clothes and my stiff towels! Okay, okay – I’ll give it a try! I’d been thinking about getting an outdoor line (or getting after my hubby to help me improvise something) but it was waaaay down on the new house “to do” list. You’ve convinced me to bump it up! At the moment, the only line-drying I do is the relatively delicate stuff on racks next to the furnace – which works great in the winter but in the summer makes for damp mildewy-ness (our basement is primitive). The paens to line-dried sheets make me want to try it! WHAT?! are there some municipalities that don’t allow clotheslines?! that is one of the most obnoxious things I’ve ever heard. I rent and I was SO excited to move into a house with a huge backyard and awesome clothesline last year… I have to move somewhere without a clothesline at the end of summer 🙁 but I’m going to try to figure something out! PS. your carabiner “retractable clothesline” idea is totally genius! Thanks. It’s the perfect use for all those “Not for rock climbing” clips that seem to creep into my house. Hi Katy, great piece! I love hanging my clothes out. Even though warm-ish, dry spring days have been few in New Jersey this spring, I still have already hung out countless loads. I just save them up and if I have to do five loads in a day, so be it. I love the feeling of hanging wash out, love the texture of the towels (I don’t understand the American pre-occupation with soft towels), and the scent of sheets. I lived in Ireland for five years, just returning in 2009, and seemingly everyone hangs their clothes out and/or in their homes to dry. I purchased this mega-made-in-USA wood rack a couple years ago and love using it in the winter in the basement or in the summer outside for undies, etc. Anyway, I really wish more people would line dry. I am the only person in my neighborhood of 200+ houses who does line dry and we have no prohibition from doing so. People have gotten lazy and wasteful. It is such a thrill and actually does add to one’s daily exercise. It is one of those activities that really feeds one’s soul, corny as that may sound. My POA has a rule against clotheslines (no permanent structures), but not against hanging laundry out to dry, so I’m putting in a clothesline. Either a retractable, or 2 marine cleats that I string a clothesline from. I *know* one neighbor behind me will complain, but I read the covenants and she’ll just have to suffer. Besides, she’s almost never out back on her deck. I almost live on my back deck, so I might do my ironing out there, too! I like soft towels, but I love-love-love absorbent towels more! I use vinegar in place of liquid fabric softener, and everything looks so much cleaner! Just shake the towels a bit more to soften them up. 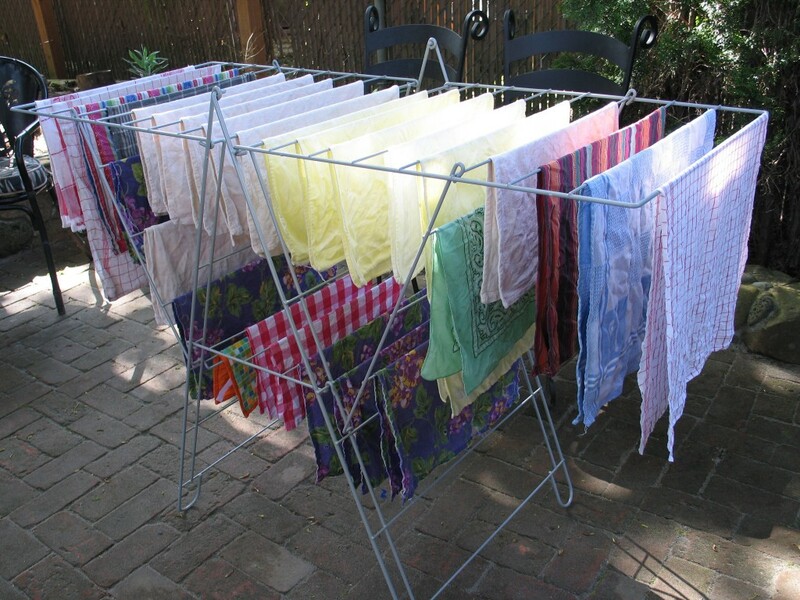 Our HOA forbids lines.I have used three portable dryer racks for years.i set them outside, and in Arizona, it takes about 10 minutes TOPS for EVERYTHING to dry.I can dry a lot of loads in one day! If weather is bad (rarely)I simply bring them indoors.NEVER use my dryer!!! 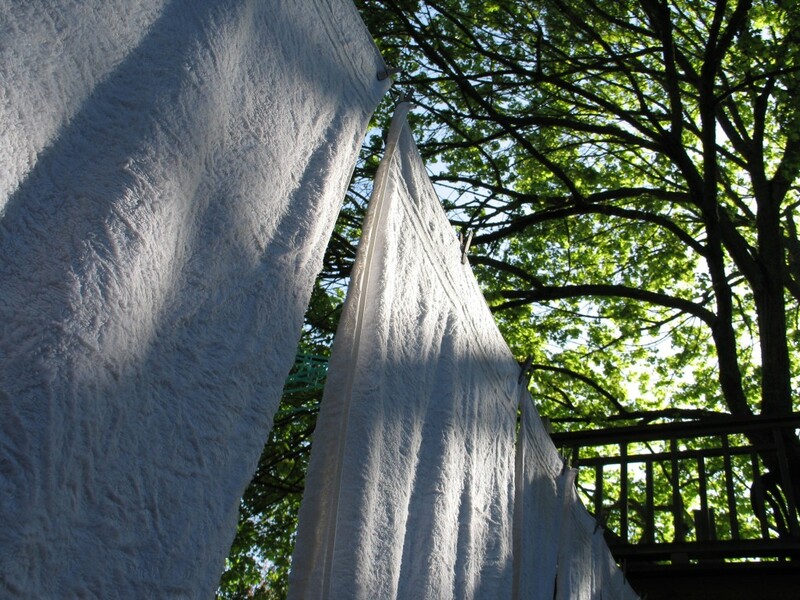 Would love to have a big ole clothesline like the ones I grew up with in our backyard in New Jersey,though.. a line full of fresh sheets blowin’ in the wind is beautiful , not an eyesore! We solved the where to put the clothesline problem with an umbrella type line. My husband sunk a pipe in the ground and the pole from the clothesline fits in it. When we’re not using it we can easily pull it out and fold it up. I hang sheets, towels, and other big things regularly, but have to admit when I hit my 75th birthday I opted out of hanging socks and undies and other small things. This is soo timely. I absolutely love my clothes lines. I never gave a thought as to allergies and not drying outside. But it has not affected any of us. 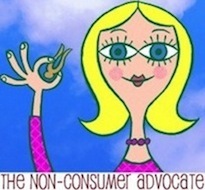 I just wrote about Why I love my Clothesline http://granolacatholic.blogspot.com/2011/05/why-i-love-my-clothes-line.html. Because I do. We have lots of pollen and allergies in my house and I do not own a dryer. I dry every thing for my family on a couple of these clothes drying racks. This is the system that I use that works for me. I start a load of laundry when I start supper. By the time supper is over and kitchen is clean the laundry is also done. I set up a rack in my kitchen in front of the refrigerator. This has the added benefit of stopping late night snacking and before breakfast I have to take them down. I set up a rack in my kitchen in front of the refrigerator. This has the added benefit of stopping late night snacking and before breakfast I have to take them down. I just wanna check, if the height of the “arms” (or “wings”) of this Frost rack adjustable? The arms are adjustable. And I’ve and no problems with rust, but it’s never left in the rain either. Great post, so interesting to read. Americans are banned from putting up a clothesline?! You learn something new everyday. The hills hoist is an icon of Aussie backyards. It’s very rare to find an Australian backyard without a clothesline. Thanks for sharing! Previous post: How Do You Make Extra Money?